Beatrix and Ivan met online. Originally from Manila, Philippines, Beatrix was living in Singapore at the time and working as an early childhood teacher. Like many couples, they did the long distance relationship thing; patiently, prayerfully waiting for the day to be reunited in love. It was evident that Ivan wanted Beatrix to be his forever, to infinity and beyond. And so, Ivan proposed to Beatrix at a private condo with the bride's family present. And in June, they were joined together as husband and wife at an intimate backyard patio wedding in Herndon, VA.
As a couple, Beatrix and Ivan enjoy delicious eats, going to amusement parks, traveling to exotic tropical destinations and simply being with each other -- and their families. Beatrix is a huge fan of all things matcha (like me!) and Ivan can be described as an "OC", or "original character". He has a goofy sense of humor that makes everyone that meets him crack up with laughter. Beatrix was radiating on her wedding day, which took place in her (new) family's backyard patio overlooking the woods. 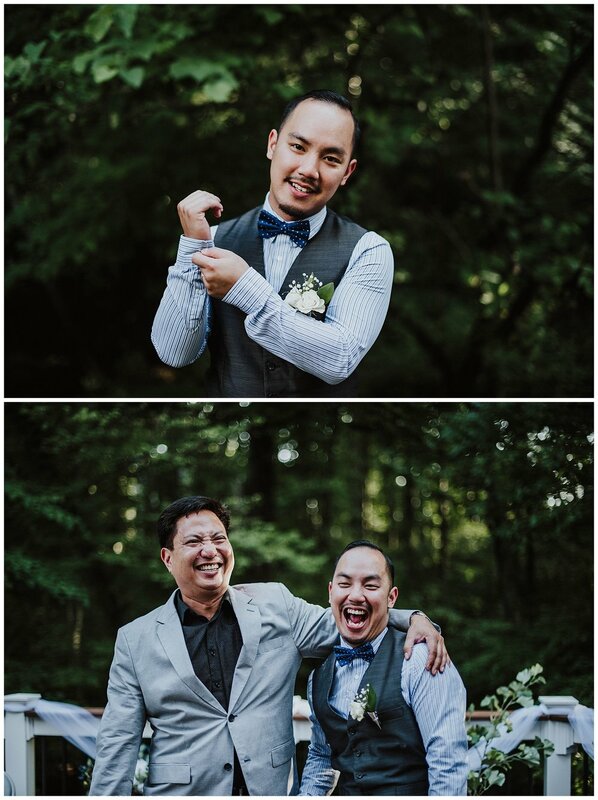 Close friends and family members joined together to witness these two declare their love and reunion with each other. In fact, the wedding was also live streamed via FaceTime so that the bride's family in the Philippines could also watch her journey into marriage! The backyard patio was the perfect backdrop for a rustic and laid-back summer BBQ wedding. There were so many funny moments and endless laughter to round out the day. Not to mention a sparkler's AND silly string exit, red velvet bundt cake and these two, madly in love. Congratulations, Beatrix and Ivan! It was a pleasure being a part of your big day! With the Bride & Groom... CONGRATULATIONS!